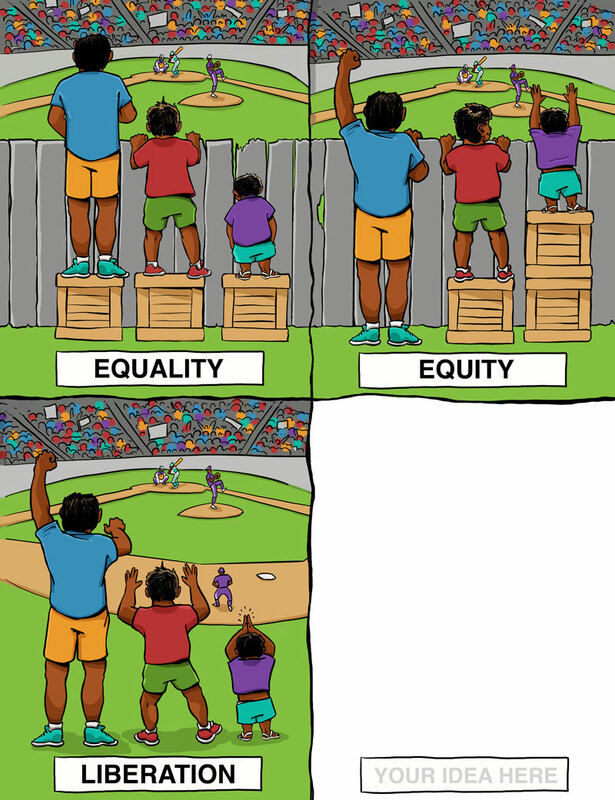 Recently the conversation about social justice in education and generally has shifted from equality to equity. As many before me have noted, equality focuses on every student getting the sameresources or supports. Equity, on the other hand, requires that we give every young person what they need to be successful. This idea has also been famously illustrated and reimagined using the analogy of spectators at a baseball game. As someone who entered teaching with racial justice as the ultimate goal, equity has always been important to me, even when I didn’t know the vocabulary to describe it. But when it comes to actually creating equitable classrooms, it’s a lot easier said than done. Over the years I have struggled to achieve full equity in my classroom, in part I think because I’ve felt competing priorities as a classroom. For example, I abhor test prep, but I know that my student’s academic success will be partly measured by their standardized test scores. Lately, though I’ve tried to rethink this series of trade-offs. I’m now trying to envision a holistic approach that holds together multiple domains. In this framework, I think of equity in my classroom as including the content that I teach, the pedagogy I use to teach, and the results of my teaching. It has always been tempting for me to think of one of these components, such as content and curriculum, as the foundation of equity in my classroom. But the purpose of this framework is to rethink this type of prioritization and understand that equity requires all three components concurrently. This framework isn’t necessarily an original concept, but it is a way I’ve tried to organize the tenets of equitable teaching that I’ve learned from scholars like Lisa Delpit, Gloria Ladson-Billings, and Chris Emdin, as well as my own experience working in five different high-poverty schools in the Bronx and Harlem. What we teach matters. I know this isn’t a groundbreaking statement. And yet, I have been in schools where we talk a lot about changing outcomes for our Black and/or Latinx students, and meanwhile, we teach generic curriculum produced by Harcourt, Pearson, and Houghton-Mifflin. We cannot expect to achieve equity if our students aren’t excited about what they’re learning. And engagement requires content that is relevant. Relevance implies both the students’ interests – music, sports, animals – as well as the students’ cultures. Returning to equity as giving every student what they need, let’s remember that the majority of books, TV, and movies, are skewed towards a white audience. Too often when people of color appear in media, they are stereotyped. People of color are similarly erased from history textbooks. Thus, our students need positive, honest portrayals of people of color in their curriculum. In addition to a curriculum that provides our students “mirrors” as well as windows, we must think about the delivery of said curriculum. Teaching that provides kids an opportunity to liberate their minds, while restricting their bodies, cannot be equitable. I’m thinking of the many “no excuses” charter schools in New York City, where I teach. These are schools that cheer about their unparalleled test results, while forcing their kids to sit robotically in class, and move through the halls, eat breakfast and lunch in silence. If our classrooms do not allow kids to be kids, then we are not promoting equity. Kids need to move. Kids need to socialize. Kids need to make mistakes, and learn from them, without fear of humiliation. I’ve also had to be careful about teaching too much on the other end of the spectrum. My first year of teaching I told the kids, “I want you to be in charge of this classroom.” And they were. But not much learning was accomplished because I was not an effective authority figure. Even once I mastered community building in my classroom, I have still had to be thoughtful as a white teacher who subconsciously prefers my cultural norms of communication and teaching. Lisa Delpit describes this dynamic as part of the “‘skills’ versus ‘process'” debate in her essay “The Silenced Dialogue“. Thus there needs to be a balance between providing structure, and direction, while also honoring the humanity of our students. In my fifth year of teaching, I started working at a progressive elementary school. My students called me by my first name, they didn’t have to wear uniforms, and there was an emphasis across the school on hands-on learning. I was excited by this philosophy, but I was new to it, and so I made mistakes. I planned an informational reading and writing unit on the Civil Rights movement. My kids were excited to learn more about the history of the movement. We visited the Schomburg Center for a film screening, and welcomed the president of the New York chapter of the NAACP, Hazel Dukes, into our classroom. But when the unit was over, I was disappointed by my students’ work. 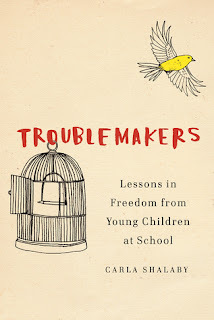 In my attempt to give my students more freedom, I hadn’t adequately supported my struggling students, nor pushed my higher performing students. In an educational system that already severely underestimates the abilities of Black and/or Latinx children, this was unacceptable. If we teach our students to know their history and allow them to lead their learning, but they ultimately fail to meet grade level standards, then we have failed at achieving equity. Our students need to be given the best chance to succeed beyond the walls of our classrooms. And while we might simultaneously work to redefine or replace harmful definitions of success such as standardized tests, we cannot pretend our students aren’t currently being measured by these current criteria. Our kids need to learn how to read, write, and numerate. They need to be respected as human beings, and to experience full childhoods. They need to learn about themselves, and their history, and to be resilient against negative stereotypes in the world around them. As teachers, we are responsible for creating classrooms that provide all these things. To do one without another is to fall short of creating a truly equitable classroom.